US President Donald Trump and the Democratic leadership in the House of Representatives vowed on Wednesday to find common ground and work together on legislation, including on reducing healthcare costs, infrastructure investments and tax reform. The move to bipartisan language came in the wake of bruising and divisive midterm elections which saw the president’s Republican Party lose control over the House, though it held onto its majority in the Senate, potentially setting up a gridlock. Control over the House could empower the centre-left Democrats to launch investigations into the president, including demands to see his tax returns, explorations into allegations of corruption and probing Russian election meddling. He vowed to retaliate against any such probes using the Republican majority in the Senate. “If that happens, we will do the same thing and government comes to a halt and I’ll blame them,” Trump said. “I would like to see bipartisanship. I would like to see unity. Maybe not on everything but I think we have a very good chance of seeing that,” he said. Nancy Pelosi, the Democratic leader in the House, issued her own appeal for pragmatism and good governance. “We will strive for bipartisanship. We have a responsibility to seek common ground. Where we cannot, we will stand our ground,” she said. 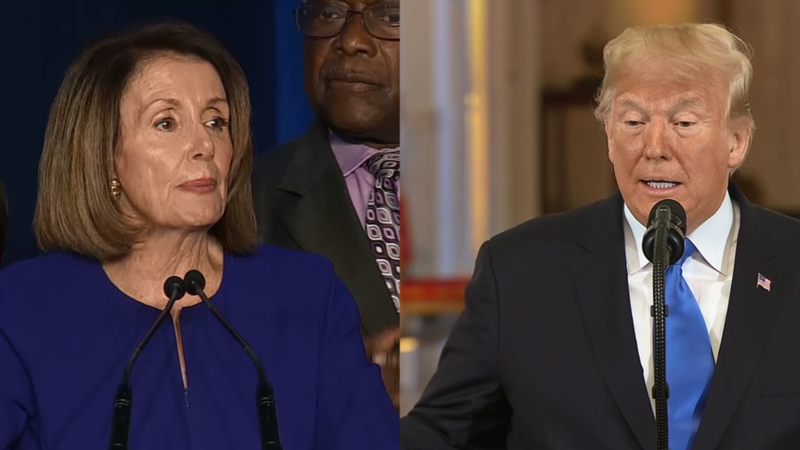 “I don’t think we will have any scattershot freelancing in terms of this,” Pelosi cautiously told a press conference when asked about launching investigations. Trump used a sprawling press conference of his own, which lasted nearly 90 minutes, to take credit for Republican gains, especially in the Senate, and hammered away at members of his own party who lost after they distanced themselves from the White House. Trump said his party “defied history” by making gains in the Senate – citing trends that show the president often struggles to hold onto seats during midterm elections – as he chalked it up to his near-daily campaign rallies. “This vigorous campaigning stopped the blue wave they talked about,” Trump said. The press conference saw the president engage in testy exchanges with reporters, calling one a “rude, terrible person” when he refused to sit down and slamming a black reporter’s question as “racist” when she asked about white nationalism. The campaign was marred by violence, including an assault on a Jewish synagogue by a white supremacist which left 11 people dead, while an apparent supporter of the president sent mail bombs – that did not explode – to leading critics of Trump. The president was repeatedly asked about his sharp tone and rhetoric that has been blamed for inflaming tensions, a question brought into focus by his purported desire to reach across the aisle to Democrats. Several races were still not called, meaning the exact make-up of the Congress has yet to be determined, but the Democrats picked up about two dozen districts in the more populated House while the Republicans look to gain two members in the 100-seat Senate. Tuesday’s results were in line with polling predictions and historic patterns, which show presidents often struggle to keep control over Congress during the midterms.